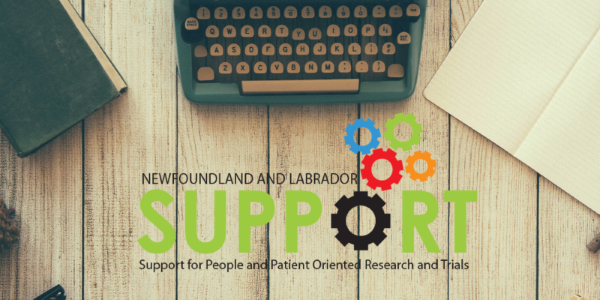 WELCOME to the inaugural edition of SUPPORT Letters, the official newsletter of the Newfoundland and Labrador SUpport for People and Patient-Oriented Research and Trials Unit (NL SUPPORT), where we'll bring you the latest updates on what we're doing to encourage the growth patient-oriented research in the province, updates on training programs and funding opportunities, success stories from the research we're already doing, and so much more! Your NL SUPPORT team continues to grow! Over the last quarter, NL SUPPORT welcomed a number of very talented new staff members, bringing our complement of dedicated full- and part time staff up to six. These new faces bring with them new-to-us skills and expertise in patient-oriented research, letting us expand our slate of services for applied health researchers in the jurisdiction. At present, NL SUPPORT and our partners through the Translational and Personalized Medicine Initiative are currently engaged in over two dozen applied health research projects. Many of these were reported on during the annual TPMI Research Day last October, and more again will appear in October 2016. Want to contribute to SUPPORT Letters? Have a idea for new column or a hot tip on what's happening in applied or patient-oriented research in Newfoundland and Labrador? We want to hear from you! Drop us a line at dale.humphries@med.mun.ca, or via any of our other contacts.